Sandwiches and Science: Training (for) Better Presentations marks the third run of the professional development event hosted by Tau Beta Pi aimed at providing Michigan Engineering graduate students the opportunity to enhance their scientific communication skills. This Winter, the event will be co-hosted/sponsored by TBP and the graduate societies of MSE, ECE, and ChE, and also sponsored by the Office of Student Affairs! As "learning-by-practice" event, it aims to help students learn how to effectively convey the "big picture" value of their research to a diverse audience, while also engaging a dialog of science and engineering research among graduate students across the entire College of Engineering. The event is aimed primarily at graduate students planning to take their candidacy exam in SP/SU 19, but anyone is welcome to participate! We will host 7-10 events in W19, and event dates/times will be announced on a rolling basis. Each session is structured to have student speakers (2-3 per session) make a timed (15-20 min) presentation on their graduate research to a broad engineering audience and a communications expert panel (3-4 panelists). Our expert panelists will provide constructive feedback to the speakers (and the audience), highlighting the positive aspects of each presentation and also indicating opportunities for improvement. 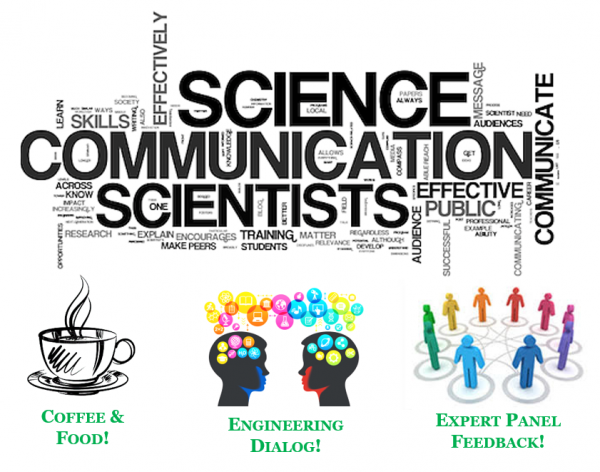 This structure will allow for the speakers to receive specific feedback on their communication skills, while also providing the audience with generalized guidelines for good scientific communication. If you would like to participate as a speaker/audience, please fill out the links below. We will follow-up with you with scheduling details. NOTE: The event is open to ALL CoE students, regardless of TBP membership status. *You will be prompted to create a short guest profile.